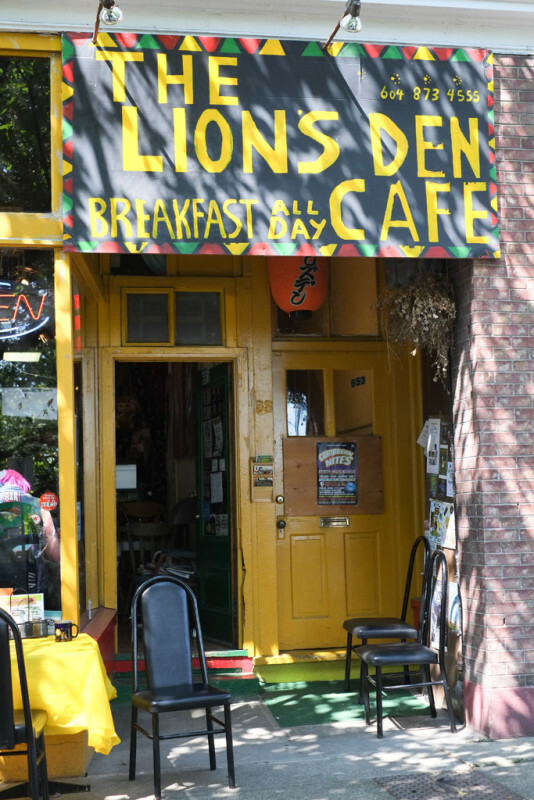 The Lion’s Den Cafe is located on the same strange triangular block as Les Faux Bourgeoise and Matchstick Coffee Roasters. Additionally, Sal y Limon is close by, and Twin Peaks-inspired The Black Lodge is across the street, beside the cannabis-infused pizza place Mega iLL. So this area is bit of an under-appreciated gem. The owners Ken and Junko are the friendliest characters you’ll ever find. Well, Ken is friendly but Junko has this stern “Soup Nazi”-type personality that I just love. She demands respect and you’ll either love her or hate her. She’s Japanese and she does all the cooking herself (even the Jamaican dishes) and the taste of her food definitely puts her in the “love her” category for me. Ken told me that she learned how to cook Jamaican food from him and his grandmother. I got a couple dishes to-go. I’d be happy eating these dishes in Toronto, that’s how good it is. Check out their menu online. They also serve Japanese food like okonomiyaki and teriyaki, and also a hybrid they call “Japaribbean” which basically a combo plate of jerk chicken and teriyaki chicken. But I always get the Jamaican stuff cuz it’s so good and I love it so much. Public Service Announcement: If you want to order any of these dishes, kindly call ahead to make their job easier. Sounds weird, but trust me. Call ahead. 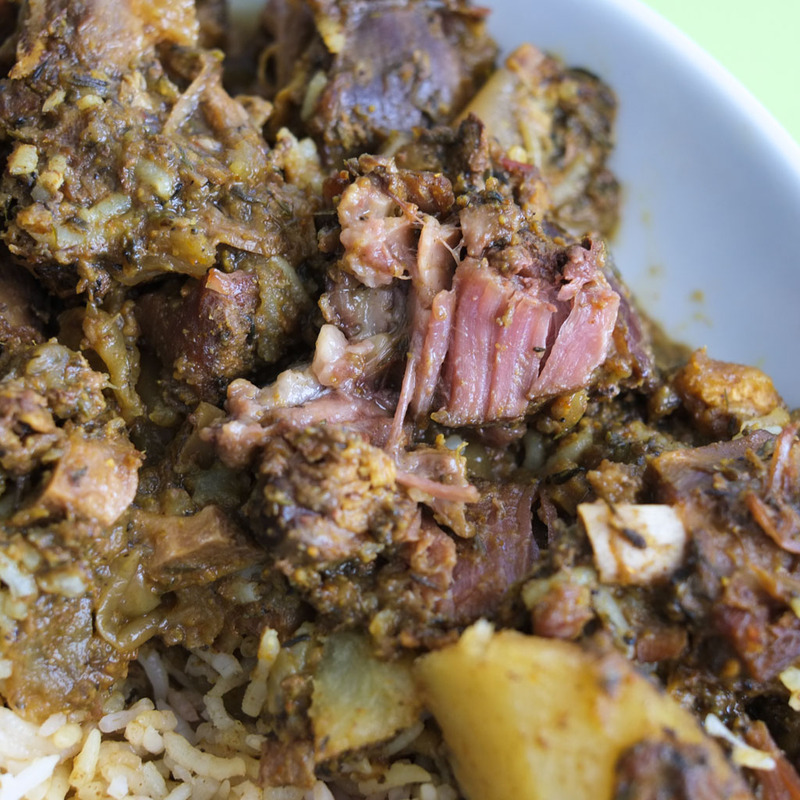 Oxtail Stew. The recycled paper takeout trays got limp and soft from the steamy food, so I replated the food when I got home. 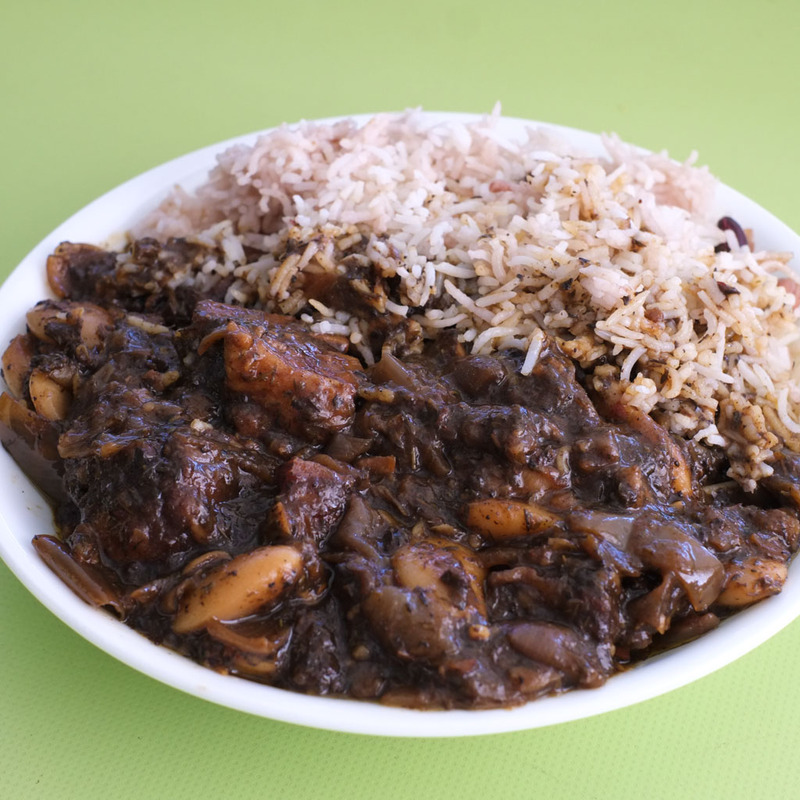 Jamaican food isn’t the prettiest but damn it makes up for it with pure flavour and soul. At only $12 for a large serving, it’s very reasonably priced! 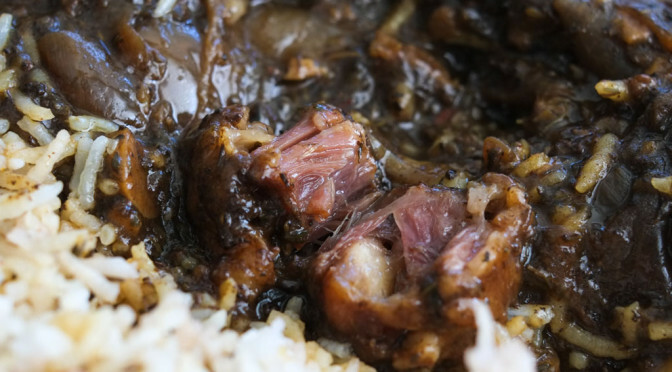 Have you ever looked at a tray of oxtail at the supermarket? Sticker shock or what?? I absolutely HATE IT when oxtail isn’t cooked long enough. 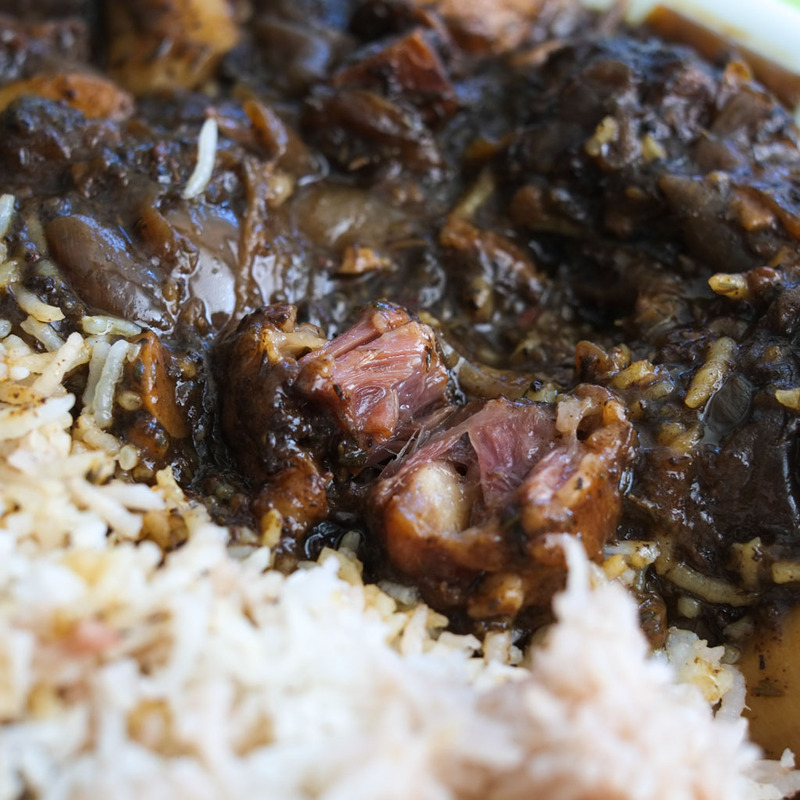 I do not want to fight my oxtail. Lion’s Den cooks it hours until it just melts. SO GOOD! Tons of rich, deep, flavourful gravy with lots of onion and big flavours of thyme and oregano (I could be very wrong with the seasoning but that’s the essence I got from it). I love those broad beans too. The rice contained kidney beans and some black eyed peas. The combination of everything is so satisfying and feels soulful in a way that other cuisines can’t match. Curry Goat, a large for also just $12. Cooked 12 hours so it’s really tender and bone-sucking good. 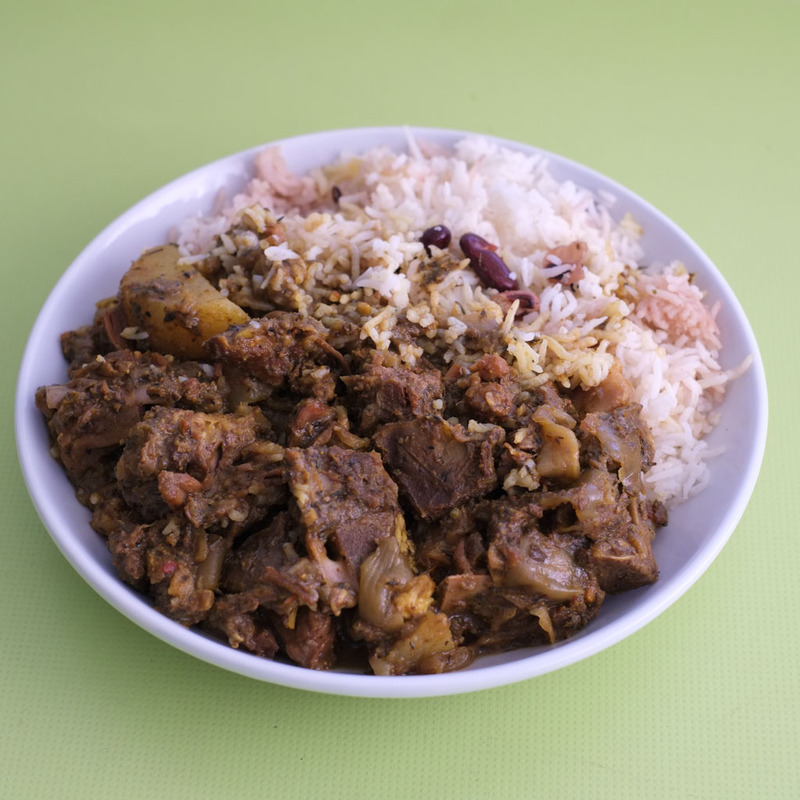 Classic Caribbean goat curry flavours. I really liked how both dishes had plenty of deep flavour without being too salty. I’d get any of these dishes again. And again. BONUS INTEL: If you check out their Facebook page, you’ll see that they post info about their Southern food nights. They invite longtime Vancouver chef Big Al to take over their kitchen twice a month on Saturday nights to cook up Southern/Louisiana staples like fried chicken, ribs, catfish, gumbo, jambalaya, and cornbread. The next one is happening this Saturday, May 23! I’m excited. You may remember Big Al and his place at Bentall Centre downtown (and before that, a restaurant on 1st and Rupert).